In fusion power research, the Z-pinch, or zeta pinch, is a type of plasma confinement system that uses an electrical current in the plasma to generate a magnetic field that compresses it (see pinch). The name refers to the direction of the earliest experimental devices in England, where the current flowed down a vertical quartz tube, the Z-axis on a normal mathematical diagram. The Z-pinch is an application of the Lorentz force, in which a current-carrying conductor in a magnetic field experiences a force. One example of the Lorentz force is that, if two parallel wires are carrying current in the same direction, the wires will be pulled toward each other. The Z-pinch uses this effect: the entire plasma can be thought of as many current-carrying wires, all carrying current in the same direction, and they are all pulled toward each other by the Lorentz force, thus the plasma contracts. Its use in the fusion field comes from research made on toroidal devices, initially in the Los Alamos National Laboratory right from 1952 (Perhapsatron), and in the United Kingdom from 1954 (ZETA). In ZETA the external field was generated in a large magnet which was fed by a huge bank of capacitors, hoping to quickly pinch the plasma to fusion temperatures. Instead they found that the plasma quickly became unstable and "broke up" before it was compressed to these levels, and applying the current more quickly simply made it break up faster. After some study a number of reasons for this behaviour were discovered, and it appeared they were impossible to avoid. They did notice several neutron production spikes that the researchers initially attributed to fusion, which generated some news for a time, but later it was realized these were due to the instabilities themselves. The last few firings showed an odd "quiet period" of long stability in the system, but the nature of these quiet periods, or quiescence, was not fully researched. ZETA seemed to suggest that the pinch concept was simply unworkable, and the efforts with ZETA ended in 1958. At LANL, Jim Tuck felt that it might be possible to avoid the instabilities by slowly increasing the external current, instead of doing so rapidly as in the British experiments . In early 1952 Tuck's group had built a small device they called the Perhapsatron, but found the same sorts of problems as ZETA. A second attempt with fast pinch again ended with similar results as the British teams, namely the faster you squeezed, the faster it broke up. Efforts to add additional stability with external magnetic fields, referred to as "giving the plasma a backbone", also failed, albeit at a somewhat higher density. The z-pinch efforts were by no means outright failures. Efforts with other styles of pinch fields continued until the 1970s, notably theta-pinch. More importantly, the "quiet period" seen in the later ZETA runs turned out to be far more interesting than anyone first realized. In 1974 Ted Taylor examined the results and found a new class of self-stabilizing plasmas known as the reversed-field pinch. Research into these class of plasmas became a major effort in the 1980s and '90s. An entirely new concept for the use of Z-pinch started in the 1980s. Instead of using an external magnet to generate the induction field, a set of very fine tungsten wires running around the fuel would be "dumped" with the current instead. 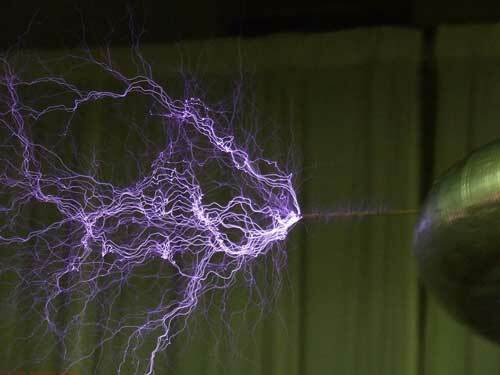 The wires would quickly vaporize into a plasma, which is conductive, and the current flow would then cause the plasma to pinch as in prior experiments. The key difference is that the plasma would not be the fuel, as in previous experiments, but used solely to generate very high-energy X-rays as the metal plasma compressed and heated. In order to be efficient, this process requires the use of a heavy (or "high-Z") metal.The x-rays compress a tiny fuel cylinder containing deuterium-tritium mix, in the same fashion that the X-rays generated from a nuclear bomb compress the fuel load in an H-bomb. This sort of Z-pinch system has much more in common with inertial confinement fusion (ICF) systems, and is generally referred to as one. For details on the reaction within the pellet, see the main ICF article. To date the only serious effort to build such a device is Sandia National Laboratories' Z machine. They can be found in various institutions such as Cornell University (USA), Sandia National Laboratories (USA), Nevada Terawatt Facility (USA), Ruhr University (Germany), Imperial College (United Kingdom), Ecole Polytechnique (France), and the Weizmann Institute of Science (Israel). * "Physics of 'Ocean's Eleven'"
* The MAGPIE project at Imperial College London is used to study wire array Z-pinch implosions.